Mangaluru, Feb 13, 2017: A non-functional electrical transformer on the compound wall of the University College has been painted to resemble a cupboard filled with books. The faces of two children are drawn on either side of the cupboard, as if calling students to read books. This is among the paintings by artists from Aaditava Arts and Mahalsa Arts School that will be showcased on the 1,000-feet compound wall of the Government Wenlock Hospital and University College, off the busy Hampankatta Road. As many as 35 artists led by Shailesh Kotian and Vikram Shetty have been working on these paintings since February 2 and now only 328 feet of the wall is remaining. These paintings, which range from local culture to education and health care, were created to mark the 200th Swachh Mangaluru campaign of the Ramakrishna Mutt. 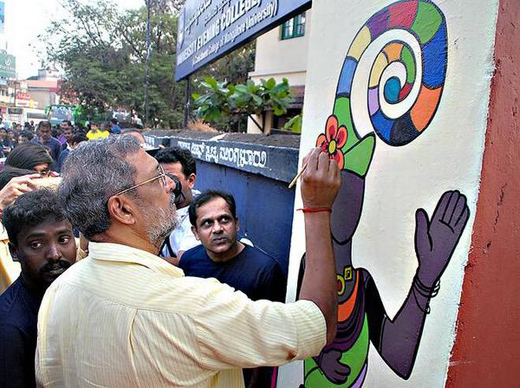 Veteran actor Nana Patekar, who is also a artist, gave the finishing touches to a painting to inaugurate the art, which has already been completed, on Sunday. On the centre of the compound wall of the University College is the painting of Ravindra Kalabhavan, a heritage building, which is now being renovated. Paintings of Kambala, Bhootakoola, Car Street temple fair and Mangaluru coastline are also seen here. There are also paintings on tribal dance, education, water conservation and Swachh Mangaluru campaign. Among the paintings on compound wall of the Wenlock Hospital include one related to malaria prevention. Wow the the compound walls look beautiful an colorful . Every painting conveys the message to the people.